Instagram now boasts 300 Million Daily Active Users. In total nearly 80 billion photos have been shared on Instagram since its beginning. This is clearly where the action is in terms of social photo sharing – the question is how best to utilize this vital platform in restaurant marketing. There are two components to engaging your customers on Instagram – through their Instagram account, and through the restaurant’s account. Both offer opportunities to engage diners, and extend your profile virally through the community. First – develop an overall photo policy at your restaurant that includes specific Instagram references. While I realize the fact that some patrons that are unable to touch their dinner until it’s been photographically memorialized can sometimes be distracting to other diners, it is a phenomenon that is now part of the culture. One that can also, unlike people blabbing into their cell phone at the next table, be used to your advantage. Your staff should have clear instructions on how to gently discourage patrons from the use of flash in the dining room, or for that matter setting up tripods and standing on their chair for a dramatic overhead shot. Common courtesy should be a standard that can be encouraged without resorting to actual law enforcement. Your staff should also be aware or your restaurant’s hashtag – those little identifying words or phrases that begin with #. You can also consider adding your hashtag to your menu. Tacky? Remember how you scoffed at the early adopters that added their Facebook links and Twitter handles – the practice is now de rigueur. Uses – there are numerous ways in which you can engage your customers and encourage them to share photos of your restaurant with their friends. It can be as simple as doing a regular search for your hashtag on Instagram and then reposting their photo to your Facebook or Twitter account. If customers ask one of the staff to take their picture you can have servers remind diners that if they add your restaurant’s hashtag you’ll be happy to post their picture to your Facebook, or Pinterest account. Another great implementation can be with the wine program. Customers love discovering – and then telling their friends about – new wines. A quick Instagram pic is the perfect mnemonic device for cataloging their favorites, and an easy way to share their discoveries with their friends. This is a practice we’ve had great results with at Mario Batali and Joe Bastianich’s Otto Pizzeria in NYC. 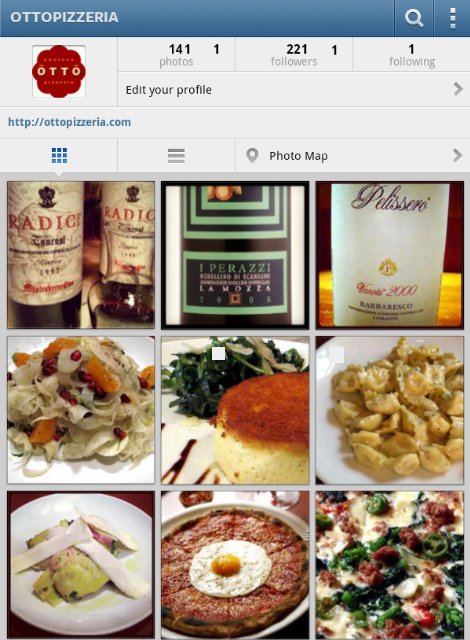 Second – you also need to create an Instagram account for the restaurant. This is simple, although as of yet it can only be done through a mobile device. If nothing else this will enable you to reserve your unique username – which, if you dragged your feet registering your Twitter or Facebook name, you know can be a problem if you delay. You don’t want to be known as @TheOtherJoesPizzaInDubuque. The same goes with hashtags. There is probably one already associated with your restaurant – if it isn’t specific enough actively promote one that is through your other social media channels – Facebook and Twitter. Popular photos to post can be new menu additions, desserts, cocktails – you can even encourage the Chef to take pictures of dishes while they are prepared. Remember – it’s all about engagement – it can be informative as well as promotional. One of the most popular features of Instagram is the collection of creative filters that users can employ to give their photos a variety of different looks. Changing lighting, color, borders, etc., can result in some strikingly original interpretations of their subjects. While it’s fine for patrons to indulge in these tools of artistic expression, you should refrain from using them when photographing your dishes. Your chef has worked hard to plate and present his menu exactly as it should be seen – it shouldn’t be subject to third party interpretation by another member of your staff. Since Instagram was bought by Facebook this effectively ended the honeymoon the popular photo app had been enjoying with Twitter. Twitter retaliated for the snub by cancelling Instagram’s right to post photos directly to a Twitter user’s account – now you have to post to your Instagram account, and then add to Twitter. A huge deal? Probably not, but it does mean that people will be sharing directly to their Facebook Timeline more often because it’s easier – and recent statistics bear this fact out. The shoe you hear dropping is Facebook’s just announced changes to the entire News Feed structure on their pages. The most important of these changes from a business point of view is the fact that pictures are going to be displayed in a much larger format. You can guess where most of those pictures are going to be coming from. Food photography is now a large part of restaurant culture and Instagram has become the clear leader in how people share pictures of their dining experience. With Instagram now a part of Facebook it will play an ever expanding role in the largest social networking platform on the planet. As these channels mature, and demographics age, they are going to become more and more integrated into our daily lives in ways that are only just beginning to reveal themselves. Like all social marketing tools it is much better to get out in front of the trend and control where you’re going instead of playing catch up. Instagram is a wave you don’t want to miss.